We’ve had some bad downtime this week. On Wednesday (2018-05-30) something got wedged and games stopped being recorded. Jim and I were both busy and not paying close attention and so I didn’t notice till Thursday, when I happened to pull up the page during some downtime while my hair was being cut. I ended up remotely debugging and fixing the problem on my phone which was a pain, but worked and made me feel like I was some sort of elite hacker. Today (2018-06-02) our SSL cert ran out for some reason and so things weren’t working until Jim fixed it. Also today, we hit our 2,147,483,647th game played! If you don’t recognize that number, it’s the largest 32 bit signed integer (0x7fffffff if you’re into hexadecimal notation). That means that no more games can be added because the number that identifies the games can’t get any bigger. This was kind of a stupid oversight on our part and is the reason you are seeing the euphemistic “The server is undergoing maintenance” message when you finish a game. When we started this site in 2005 we didn’t think it would ever be popular enough for a number that big to come into play. Last year I even read an article about this exact thing happening to someone else and felt pretty smug that we weren’t that dumb. Oops. The annoying thing is that all those games take up a lot of space. We have our database on 2 disks (volumes, technically)—one is a 2TB SSD (the main high score tables are there) and is 77% full. The other is a 4TB hard disk and is 95% full. The only way to permanently fix the issue is to re-write the data out which means we need double the amount of space we currently have to fix it. That means buying more disks, which will take a couple days (I don’t think there’s any place locally I can buy them so we’ll have to mail order from Amazon). The long and short of it is that currently high scores are down and it’ll take us a few days to get back up and running again. The message is true though, the scores are being written out to a different disk and when the db is alive again we’ll import all those scores. If you read that article I mentioned, you might have noticed they had a quick fix to delay the inevitable. We’ll might do that tonight and get things kind of working. But we’re going to have to do a permanent fix soon-ish and so you’ll probably be seeing more of the “undergoing maintenance” message in the next week. Our crusty old server decided to die in the middle of the night. Because it’s housed in a satellite office of our hosting provider, there was no one on staff to reboot it. I had anticipated this and made a backup of the machine about a week ago. Jim and I spent Sunday morning getting the backup restored onto the shiny new server (currently hosted at my house). That is currently what the main site is running on. The blog and the forum are still running on the old server. We’ll be moving those to the new server when the new disks arrive (Amazon says Wednesday). We’ve copied the database to another computer with enough space and updated the DB to the latest version (Postgresql 10 if you are curious). We’re currently converting the id column that ran out of room into a representation that can hold bigger numbers (ALTER TABLE for you SQL nerds). This is unfortunately a slow process due to the size of the data. We started it going last night and it looks like it’s maybe 30% done. During this time the DB is completely offline and that is causing the server code to…not be happy. It can’t authenticate users (because users are stored in the DB, too) and so it’s not even saving games. Sorry about that. When the conversion is complete we’ll bring the DB back online and scores should be immediately be working. The disks all arrived and are all installed. We’re still converting the id columns. It’s very slow because the database has to more or less rebuild itself completely. Also we had a bug in the conversion script and once it got halfway done (after about 20 hours) it died and reset all the progress. :-/ That’s fixed though so this time it should work (fingers crossed). The database id column conversion finally finished. Took 79 hours to run. I’ve pointed the site to the server where the database is temporarily housed and will begin copying the data back to where it is supposed to be. This temporary database is not stored on SSDs so things might be slow. We’re not sure the disks can handle the full Green Felt load. It still might be a few days before everything is smooth. The database is back where it belongs, on the new SSD. Unfortunately there was a bug in my script that copied the DB over and I didn’t notice until I had switched over to it. I probably should have switched back to the other DB and recopied, but I didn’t realize the extent of the problem and how long it would take to fix it (I thought it’d be quicker this way—I was wrong). I’ve been rebuilding indexes on the DB for the past week and a half. 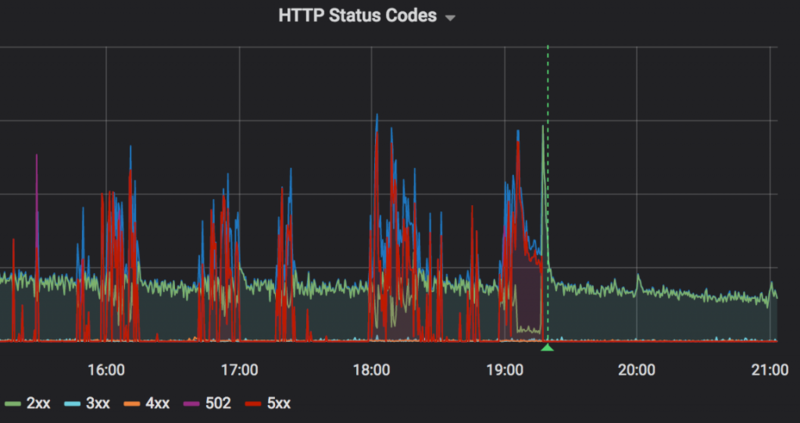 Luckily the indexes can rebuild in the background without causing outages, so high scores could continue during the process. Unfortunately the one I saved for last does require that the database go down while it’s being rebuilt. I started it on 2018-06-17 at around midnight and expected it to be done when I woke up in the morning—it was not. It’s still going, in fact, which is why you haven’t been able to save games, fetch high scores, or login. I’m not sure how long this one is going to take—I would have expected it to be done already. Until it finishes, things are going to be down. In other news, the old server (that the blog and the forum are hosted on) went down yet again for a few hours, prompting me to move those programs and their data over to the new server. This move appears to have worked. If you are reading this, it’s on the new server :-). The red line is the number of 502 errors (the “server is undergoing maintenance” errors that we all love). The vertical green dotted line is when the SSD DB came online. After that there have been no 502s (it’s been about 3 hours so far). Everything is going smoothly. We’ve imported all the games that were saved out-of-band (if you ever saw the “Your game was saved but our database is currently undergoing routine maintenance” message). As far as we know, everything is back online (and hopefully a little better than before this whole mess). Have fun! We appreciate you (Jim & David) so much and are so thankful for the site you have provided. Do what you gotta do and we will manage (somehow). As with last time, I am sure that if you need financial help the greenfelt community is here. Hope isn’t to difficult to sort out – and yay to greenfelt for being super popular. Your dedication to this site is phenomenal and I Thank You Both. what is the deal, going fortwo days now. I like to see my scores. Thankyou. These things take time. We’re still copying the data from the database to another disk with more space. It’s been copying since Saturday night. The drives we ordered still haven’t arrived yet. They should arrive Wednesday, according to Amazon. That is a good article, David, and thank you for the explanation. And congratulations on your 2,147,483,647th game played. That is amazing, isn’t it? More than 2 Billion served! I have said it before – you should ask for some contributions to help. Even 5 bucks each could give you lotsa dough to help defray your costs, and let you two guys make a buck too. This is a good service that you are providing, and you should make some money on it. I thought I was the only one who did that! One player in particular in Freecell, who shall remain nameless — my goal in any game is to achieve a score that is *only* twice as slow as hers! My secondary goal is to crack the top 10 in a game in which she does too, so she (maybe) sees my handle at least once before I depart this vale of tears! I heart greenfelt.net! thank you guys. Congratulations on your success & thank you David & Jim. I really appreciate you taking the time to explain the situation. Thank you. I feel your exasperation. This site you offer us is wonderful and I appreciate your straight forward thoughtfulness. Appreciation from your followers, for sure. Has morphed over time into something like adoration and wonder. You’re like mystical forest creatures; every day at 8pm EST you silently leave a new confection to be savored. Oh wait, it’s just the Spider game of the day! The number 2,127,. (etc) . is mind boggling. That must be one considerably large audience that you are reaching – and must be costly to yourselves. Although most of us gripe about adverts that pop up on our screens when visiting other sites, this could be one way of continuing with ‘free to users’ access to a brilliant site. Thanks for the update. I was wondering, and it’s gone on just long enough for me to have gotten annoyed, except who can be annoyed at such a cogent explanation and warm tone? I’m grareful for the site (which I use altogether too much)and for your upkeep on it. Heartferlt thanks for your maintenance. I didn’t realize how competitive I was until I couldn’t see how my playing stacked up with others. I agree with someone above, asking for a $5 donation to help you guys is reasonable and fair. I pass many hours playing various games on Greenfelt. Thanks!! The scoring is fun, but really bad was not being able to pull up a game for an entire evening. I tried all the other FreeCelll games I could find on the web, but they were awful. Your game functions so well, I’ve taken it for granted! LOVE this site. Thank you so much for building it and maintaining it. Of course I’m disappointed that the scoring is down, but realize that “things happen” and you’re doing your best to fix it. Thank you, thank you, thank you!!! Thank you for this great site. Your operation updates are informative and, for me, educational. I think a simple “donate” button would generate more funds than necessary to cover operating expenses. I, for one, would be delighted to kick in a few bucks every now and then. And I think you might be surprised at the response, keeping the site free and without ads. I do not see a downside to trying, but maybe I am missing something. I really appreciate your site and use it daily with my morning coffee or when I have insomnia. It feels like community. I recognize all the names that are competing with me for the top position. When I first found the site I didn’t believe that anyone could win a game of freecell in less than a minute. now I am there too. Your site has made my mind much more nimble. Thanks again and good luck with the memory upgrade. Is there anyway we can help? My entire family plays forty thives your website. You have provided countless hours of fun for me and the family. Thank you so much for providing this wonderful site. I appreciate the description of the problem you are addressing. I presume that it would not be practical to use a 32-bit unsigned integer and be able to double your data capacity. thank heavens you are up and running again. Apparently Postgresql doesn’t support unsigned ids, but… you can set the auto-incrementing id counter to INT_MIN (-2147483648) and get the other half of the number space that way. But that just delays the inevitable. Upgrading to 64-bit ids now is painful but less painful than if we had 4 billion games. Appreciate you both so much….i do a lot of ‘outside’ thinking while playing this game and I, a senior player, appreciate the keeping my mind working aspect. Thanks for all you do….and a small donation to Greenfelt to help out is totally cool. I love Green Felt site and play it every day in fact. I am sorry you are in a hard place right now and hope it can be remedied but am okay even without scores. I would so love it if you could add Miss Milligan. I play it daily, but the site I use is NOT animated so I have to do a lot of work to move the cards around. boo hoo Otherwise, love your site. Thank you. My husband and I love your games! Thank you for everything that you do! I am so grateful for a place to come and unwind with familiar solitaire games and to learn new ones. Have played FreeCell on your site for years. From 5PM to 9PM I play it alternately with games on Royal Games, because at that time there is “queue time” on Royal Games. To continue playing FreeCell? yes….I’d consider a small fee. My day is not complete until I have payed a visit to Green Felt. I was up all night, got 502 gateway error msg on Internet Explorer, next morning I think I was hyperventilating until I got here on Chrome. You know, Dave & Jim, I think we all want to give you some money. Why don’t you give us a POB address, and you will get lots of envelopes with $1 or $5, and we will actually be happy to contribute. Thank you for all the work keeping this game going – provides a LOT of pleasure. The numbers are boggling. Best to you! Just go ahead and whatever you need to do will just get done one way or another. . . Don’t listen to the whiny complaints . . . I’ve had HOURS (over the years) of complete satisfaction with Greenfelt Solitaire, one of the best sites on the entire net . . . Keep plugging away and it’ll all get fixed, super job and keep up the good work!! Lots of fun thanks to you – hours of it I must confess, totally addictive, with or without scores. Keeps my mind alert too (old lady talking). Thank you Dave and Jim for all the work you put into it, and for keeping us players informed. I’m impressed, though to be frank I have no idea what you are talking about ! Keep going, and be sure it’s being appreciated. How can I be upset when I know you guys are right on it! Thank you for tending my addiction. I’d put up a penny a game, even at my current level of addiction. That’s $21M if everyone’s in. Thank you so much for providing this great entertainment and for hosting it for all of us. We so greatly appreciate it and are always patient when the unexpected technical issues arise. Our best to you! I 100% agree with the majority of commenters. I’m not sure I could continue to exist w/o my daily dose of Freecell. I, also, agree that I would be more than willing to pay to play. You guys are great and I’m blown away by your dedication to maintaining this site. Please, please, please let your adoring fans help ease your burden. Idea: while the high scores database is unavailable (could be days yet, right? ), how about at least echoing the time a game took? (I’m mainly concerned with Freecell but YMMV.) It’s getting old using my cellphone’s stopwatch function on the side. I am 94 years of age and enjoy your game. It helps my mind to work each morning. Love what you provide, and thank you very much. Hope you get your game in place soon. Thanks for the games guys. And tell Fonda R Shearer you get what you paid for. More than 2b……… I guess that’s why even a few seconds on the leader board is such a rush. Thanks for that and the amazing ease with which we can play on your site. I really don’t have the patience for others. And really a penny a game would at least let you see the love in your bank account. Very addicting and so very enjoyable. A penny a game is a GOOD deal for me. Also, how do I recover my forgotten password? In the short term no, it can’t be fixed. Your username and password are stored in the database which is completely offline while we fix it. and thus forget the tangle in my mind! Thanks very much for your freecell site. I play when I am up at night. Being 77 years old, I enjoy being able to play and it helps keep my thinking working. A donation to you would be ok. My deceased husband was a tech for years. I have now remarried, my husband is a retired engineer. Have to try to keep up. Thank you, again. May God bless. Your devotion to the cause is truly appreciated. I came upon this site by accident and now can’t get enough of it! Once, only once, I came in 1st on FreeCell and framed the compliment. Had to get disciplined and limit myself to some three games daily before I do the chess puzzle. As a few mentioned, a good way for us elders (I admire Ms. 94, I’m but 88.) to keep our brains in motion. Couldn’t you set up a PayPal account into which us grateful could from time-to-time pay a bit in. That would be safe and secure on both ends, and not take up much space on the website. Keep up the good work! You are appreciated! I’ve been having fun with Solitaire for six months now. However, I have never quite figured out how the scoring works. Obviously it’s some combination of time, strokes, and cards sent upstairs, but in what proportion? I’m told that if you use your fingers instead of the cursor to make moves your time should improve. Seems logical, but true? Thank you for your dedication the the Greenfelt site. I love playing Spider on it! Hasn’t seen scores in weeks but joined on 5 June – how come? The forum and blog use a different database than Greenfelt. In fact they are completely separate programs that we didn’t write. The “joined” date is the date the user joined the forum, not the date the user joined Green Felt. One question, does the timing start when the game pops up after you hit “new game” or when you play the first card? My brother and I played around with this and think it is when you hit “new game”. (Yes, stop watches were involved in this experiment.). Seriously, thanks for this website. It is the absolute best out there with or without the high score table. I’m happy to know people are using that email link. We don’t put tracking in that so we don’t know when/if it’s being used. You are right, times start once the New Game or Replay button is hit. Love this site and thank you so much for making it available. We are an older couple and the games bring some of the mental challenges we need. We deeply appreciate the time and effort you put in to maintaining this wonderful venue. each time I try to enter the green felt website to play solitaire for about the past 10 days. I was able to get into this site that says that all is fixed. If the problem is on my end, what can I do? I’m using Win7, IE 11. @Albert Jenny: Probably you didn’t, it’s just that logins are down while the database is down. Gail, I can’t tell if you are joking or not… This entire blog post is about our progress in fixing the issue. It’s slow going and will not be fixed today. rwbubba, 502 sounds like something on our side, but I don’t see it happening right now. Those are often transient errors (though we shouldn’t be getting them at all) and if you reload it will work again. The main site (https://greenfelt.net) should load ok now, the main issue now is that the scores work. Very diss. no scores for the past several weeks, not fun to play. Hello, Delightful games. Sometimes I check to see how I am doing but mostly I go to the next game to and earn better techniques. There is a difference between a service & a business. If a minimum donation was allowed from each person it might be a good compromise. The careful details of the games and procedures are wonderful. While we’re patiently awaiting the Return of the Greenfelt, I’ve sometimes wondered how the Spider games of the day are chosen. One would guess that they are randomly selected, but evidence indicates otherwise. Most are challenging to solve to even experienced players, while non-game of the day plays are usually easier to win, and a good way to learn the game. Do you apply any program to weed out easier games to only use more difficult ones for the game of the day? It would seem that Spider, a longer game utilizing more logic and strategy than the speed games, would require selection intervention to maintain consistency of level of difficulty. Fact or imagination? All the games are random. The randomness is predictable so everyone can get the same random games, but there is no attempt to figure out if a game is hard or easy or even solvable. Thank you, Jim and David, for your dedication. Gracias, Jim y David, por su dedicación. You guys do such a great job! The delays in getting things working are quite understandable to anyone who is not a newbie. We all admire the way you keep fixing things and getting better equipment for we parasites on the Internet. When you get a means of donation set up, make sure that it is something that can take money in a variety of currencies, like PayPal. Once again, great job! Thanks for tons of fun. I enjoy your site immensely. I never played for the score;I just play to see if I can figure out a way to win the game. Speed and scoring is not essential to my enjoyment. But during this downtime, I have finally mastered Flower Garden… Thanks for all you do. Ich habe die Seite mit Google Translate auf Deutsch übersetzt. Ich hoffe es beantwortet deine Fragen. Any updates? What’s the timeline looking like now? I’m not intending to be pushy, just wondering if you have any updated estimate of when the scoring might be running again. Thanks again for all you do!! I’m hoping today. The database doesn’t give a lot of progress during the upgrade so I’m using the used disk space to divine the progress. We started using 2.3TB of disk, and we’re up to 4.7TB. We expect it do double the disk space (it has to write an entire copy of the data out, then delete the old data). So 4.7 is right about the right place. After that it has to regenerate an index for the data and that could take 30 minutes or a couple hours—I’m not sure. I’ve been on this Solitaire website for years. Is it still under maintenance? There is no update since June 2, 2018. I just wanted to make sure that I am not the only one not being able to see the results of my game when I win. Hubby and I are empty nesters. Thanks so much and hope it gets fixed soon! There are some updates at the bottom of the article, and I’ve also posted some comments here. Thanks for the latest update! At least you don’t have to wonder whether anyone cares that you operate and maintain your site. We are AVID! Thanks again! You guys are amazing, you have provided all this at no charge and it has given me countless hours of pleasure. Good luck with all the current issues! Yeah! 3:17 am. It’s working! Thanks for keeping greenfelt up and running. Thank you David! This morning on completion of a game, Freecell shows my time. Only my own: it seems I came first of the 1 people who have played! This is progress, well done. Awesome! It appears to be working now (or partially.) That’s a start! Thank you for your diligent hard work these last few days! thank you for providing this game (with or without score) as it has provided me with many hours of distraction. I lost my husband recently after 55 years of marriage so am at loose ends most nights. This is the best of all on-line games. I may have been a little optimistic in my statement about figuring out Flower Garden, but this morning-I played and my first place score showed up along with my second place score. So-fun! Great job on fixing this. I really hope the people who have not read your entertaining updates and comments (sometimes in German) realize how hard y’all worked to get this functioning perfectly again. Here’s to your next two billion games. Scores are back! Scores are back! Thanks for all your effort guys!! It is definitely appreciated by me for sure!! Hey yayy! Just played the first game of Freecell in 8 days after which the high scores loaded — the top 10 plus mine, not just mine alone. The database is definitely on the road to recovery. Oh I see. Maybe the scores worked because that was the Game of the Day. Random games still either fail to show any scores, or show only mine. YAY! It’s very nice to have everything back up and working. Thank you for all your efforts. Congratulations! I just won a game and got my score. I know it was a lot of work, but you guys came through. As if there were any doubt. By the way, my score was one of one. But then, we can’t discount any victory, can we? Thank you. No way am I the only person playing at this time of day yet every win puts me at 1 out of 1 !!!!! Love it even if I know it is not true. Would you like to play Me. It’s lovely to have the scores available again! I think that most of the Freecell players have given up, though, because I’m getting results like 1st, 2nd or 3rd among 14 or 22 players. I’m going to enjoy this winning streak while it lasts. Thank you, Greenfelt guys! Elizabeth, yep! I accidentally broke something when I changed the text at the top to point at this post instead of our bug reporting forum, and that caused everyone to revert to pure random games. Even with so many users the site feels empty when we don’t pick good games to play! Thank you guys for all the hard work you’re doing. Over here in Switzerland it is always a big pleasure to play, I am totally addicted and something is missing whenever there are maintenance works going on. Keep up the good work, it is appreciated all over the world! UH oh, back end server crashed again. Hang in there guys. Many, many thanks for the games. Has given many hours of fun for the family. It’s a good idea for a place for donation to help with the upkeep of greenfelt. Aha! Having now won at least two more hands of Solitaire Flip Three, with each of them a victory over one (or 1st of 1), I have a sneaking suspicion we are starting from scratch. Whee! Veel succes met herstellen van de site. Everything is back to norma in Freecelll, and it’s fast: looks like the database is back to running off of SSD again. Thanks david & jim! Many, many thanks to you guys for creating and supporting this wonderful site! provides much needed respute during the busy day! Somewhat addictive even! 🙂 Cant figure out how some folks manage to solve some of these games in under 20 sec, but keep on trying! OMG, cores are back! Now I have to play more carefully. Thank you for all of your hard work. Bless you both and anyone else, from an ancient sysprgmr(1964). Thank you for all the fun and procrastination you provide. Delighted that you managed to sort the muddle! Hope you catch up on your sleep soon. I prefer to play as an anonymous player. Love the website and all it’s offerings. Several times I’ve looked for a place to make a donation but couldn’t find any place to do that. You might want to make a donation section more prominent on the page so others like me could cooperate/participate. I have so much fun on your site. I mostly play addiction, and I am. Keep looking for ads to pop up, but never have. Thank you for the hours upon hours you give me to put off the un necessary stuff, like work. Would be able to help out some if needed! I love to play your game. (Great way to release tension after a day of arguing with my wife.) I too would be willing to make a contribution, either on a pay per play method or by a members only set-up with a password and reasonable dues. Hoo-rah and hot damn hallelujia — Everthing is working right — just played my usual Freecell and Seahaven Towers ans all is right with the world!! Just a little bit of patience and I knew Jim/David would fix the problem, whatever is was (explanations are nway too tehcy for me). No matter, several games on Green Felt Solitaire and I’m relaxed and in control . . . Welcome back and keep up the good work!!! Alles werkt weer en kan nu normaal een spelletje doen. Bedankt voor jullie inzet met deze zware reparatie. Seems like you have passed your test successfully – BRAVO ! Thanks a lot for the time and effort from all your grateful fans all over the world. I can get my scores on my Nook when I play there but I cannot get then to come up on my computer. Is this my computer problem or something on your end. I know you have been working on your problems and am so happy to hear you have gotten all fixed. I can still play my favorite solitaire but prefer to do it on my computer. Any suggestions? on 13 Jun 2018 at 8:27 am Barb. Hello – perhaps im missing something but when I try to access I still get the bad gateway message. I’ve cleared my cache but the error persists, anyone know how to fix? Forty thieves for me, even though I’m never fast enough. spend way too much time on your site. I have the same problem as Patricia. I can get my scores on my iPad but not my computer. Any idea why this is happening? Love this site. Thank you for the fun games. It looks like you are Canadians – eh? Barb, Patricia, 53Alpine: I’m not sure why that is happening. 502 is definitely a server error and points to a problem on our side. But it’s very confusing that one of your devices would work and another wouldn’t—I would expect that to be consistent. I would suggest on the computer, wait about 60 seconds and then reload. Also try holding the shift key while clicking reload (it’ll force the browser to reload some stuff it wouldn’t normally reload). And let us know if that doesn’t help. Jill: nope, we’re from Southern California. on 14 Jun 2018 at 11:51 am Barb. Tried your advice both waiting 60 second and reloading using the shift key but neither worked. I miss you lol!! I get the “502 Bad Gateway” with Internet Explorer version 11.0.9600.18837 in Windows 7. Greenfelt loads OK with Chrome, Firefox, Opera, and “Avast Secure Browser” in Windows 7. I do NOT see the 502 error with Edge or Internet Explorer in Windows 10 both 32 bit and 64 bit. I ordinarily use Chrome. Thanks for all the work providing this wonderful site. Hi, I have not been able to enter the website for a couple of weeks. All I get is the “502 Bad Gateway” message in the upper left corner of the screen. I’m receiving this message on both of my computers. Both worked fine getting into greenfelt prior to this outage. I hope to be able to play again. That seems to confirm the problem being the combination of IE11 and Windows 7. Has anyone seen “502 Bad Gateway” in any other environment? Not seeing scores again. Had for a few days, but none since 6/14 and today…..
Had 502 bad gateway for couple of weeks now on IE, very briefly today on firefox but it was back to normal within the hour I was away from the computer. What? Wait. You’re from southern California and can’t get disks locally? Not complaining, mind you. Just surprised. I’d be using Amazon, too. There’s a consistent request from grateful users for a donation option, but I haven’t seen you respond. Are you independently wealthy? If so, are you single? LOL Or perhaps you’re allergic to money. If so, I have a solution for you. Put the donation button on your website to appease the masses, but direct it to my PayPal account. All kidding aside, I adore you guys and greatly appreciate everything you do. We are Germans and thank you as thousands of other enjoyed fans. Thanks for your time and energy! All working great now! No delays getting scores, no timeouts, no 500 server errors. David, does this do it (for now)? Any more big fixes needed / in the works? @Judy, I could maybe find disks at Fry’s but they aren’t as cheap as Amazon and I’d have to leave the house :-). I am single but sadly not independently wealthy (though I co-run this cool solitaire website :-)). @zudensternen, Not quite done. The DB is still not copied back to the final spot. I had to do it again because of a dumb mistake that I didn’t notice quick enough. Once it’s back in place it should perform better. Also I’d like to move the forum and blog to the new machine (along with some ancillary behind the scenes stuff). After that everything will be on the new machine. That will be stable, except that it requires the help of another machine because it’s currently living in my house. We’d like to eventually move it to our hosting provider (get rid of the old machine completely) and then things should be fast and stable. Everything should generally work while we’re doing this stuff, so there shouldn’t be any more large downtimes unless something gets screwed up (either accidentally or by an act of god). Only been on this site going on 7 months, I was drawn to this site, hear recently due to medical complications green felt was my life line for first time I spent reading blogs of the recent problems when nothing else was working on site and over that time Jim and David have stepped to the plate for their commitment to this great site, they have took times from their own haircuts and lives to get this site correctly working , when it was down early this morning while and home now mending from life threatening surgery last week , I kept getting connection problems then up came a little blue button, stating use saved program to that extent ,then no time soon everything was good as ever , never was upset just took time to think when Jim and David are working hard to keep it going it does no good to rush them or complain, I have none this site of recent has kept me going Special Thanks ,jim and david. “THIS” particular site of these postings took me near 45 minutes to find due to getting the 502 error at all of the other green felt sites. I doubt that there will be many replies from Win7, IE11 users due to this fact. I am not clear on the current status of the games (I play Canfield). I keep seeing’fixed’ but it isn’t really, and site is glitchy day to day. On again, off again, on again, day after day. Nothing is truly fixed. I can be patient, and I do appreciate the site being available, but I do not believe anything is fixed, so far, and the games are really rough to use. Also, various error messages appear: sometimes backend server, sometimes 503 error, sometimes high scores can be accessed, sometimes not. So what IS going on??? I am not a techie, so I do not know how to interpret most of what appears or your explanations about the ‘fixes’. But I assure you, my games are NOT fixed. Been off for a month, now. I can only add more kudos to you both. You work so hard – I hope you know how much we appreciate all your hardwork and dedication. My day can’t start without my freecell visit. I, too, think the idea of donations to you needs to be started!!! Hey, you guys! Many thanx for your explanations. It’s nice to see you care about your users. Take all the time you need in order to get things right. I’m sure everyone understands…. Hi been waiting for server to work to see my scores. Been dwon since last week… playing isnt as much fun as seeing your scores. Any progress on the Forty Thieves site? your site has been corrupted or down all month. it worked for a few days but now again im not getting any sores. PLEASE FIX THIS FOR ME !! tHANK YOU. i LOVE YOUR GREEN FELT SOLITARY SITE AND ENJOY PLAYING IT…. I was signed in. Now when I go to the forum, I’m asked to login or register, but when I click on either one, nothing happens. ww8.greenfelt.com and I get a blank page. How can I get back to the klondike solitaire games?? 1. We love you, we love the site, we appreciate you, let us send money to help keep the site up and running efficiently. 2. The site is broken, what gives? Updates, please. HELP! Timeline? I am in camp two, but sympathetic to camp one. I am simply concerned that when it is said the site is being fixed, that some feedback is given about the state of play day to day, currently. I have yet to experience consistently smoothly running games, despite various fixes reported (by David, et. al.?) on this stream. Frustrating. The mumbo-jumbo about servers, bandwidth, usage volumes, switch-overs, etc. is interesting to techies, but does not help the bottom line: is the site going to be properly viable or not??????? When?????? cannot get on site normal way have to cick on a game in google then workd xcept for scores which don’t. !! @Pamela: Whoops! It should be fixed now. Thanks, David. It is working much better at the moment. I appreciate all that you guys do and for giving us geeks a peek at what is happening behind the scenes. For those using Internet Explorer in Windows 7: I still get “502 Bad Gateway” errors when attempting to access greenfelt.net. Interesting that blog.greenfelt.net does work in IE 11. Your best bet is to use a different browser for now. Of course most folks with this problem will never see this advice…. How often does your server need maintenance? what’s the matter? on 24 Jun 2018 at 2:41 pm Donna k. C.
I enjoy using this site but I have registered several times in the past and sometime later it is gone. I try to register again and it won’t recognize it. Another thing, how does anyone play any of the games in less than 10 seconds? Just curious. Just read about your life-saving surgery – I’m glad you are home recuperating. I’ that was a tense time for you and family. Good to have you back – get well soon. Just read about your life saving surgery – glad it worked! That was a tense time for you and your family, I’m sure. did this computer glitch cause my account to be deleted? Unable to login now, saying I don’t exist. any info appreciated. I’m going to have to give this up – now and then the site works as it should, with scores posted as soon as the game is given up, But it is SO erratic. I keep seeing messages that it is being fixed, for nearly a month now, but still there are problems. Without the scores, this is just a solitaire game that you can get on any website, so why use greenfelt when you have the constant frustration of watching those little dots go round in the hope of seeing your score? It’s been fun, but I have to say “goodbye”, and wish you luck with solving the problems. @tess, usually not that often, but this time it was a doozy. Although I will be glad when the site is functioning normally, I have been enjoying the less competitive games with no scoring–and I think my speed has gone up based on less stress:) Thank you guys for making this such a fun site to go to for a few games (an then a few more) (and then those times when I just can’t quit:) And bless you for all the work you’ve done this month. Cheers! Just a thank-you for a wonderfully entertaining site. I had no idea of the complexity of what you’re doing, so I’m doubly grateful to you both! In playing Golf, at the end of each game I still get the message that my game could not be saved (back end server not available). Is this still a residual problem related to server maintenance, or is this a new issue, or is it a problem on my end somehow? I am on Google Chrome – haven’t had a problem previously. I should say that the point of my previous post is that I can’t see how I did relative to others. With Golf, you don’t really know what’s a good score on a particular game until you see how many cards other people were able to clear. That’s half the fun of it, so I would love to see that feature working again. Thank you for the update. Congratulations on the “over 2 billion” served. Great site. Keep up the good work. No need to explain (at least to me), things go kerflooey ,as well as bump in the night all the time. Thank you so much for the fix of your website for Win7, IE11 users. Played my first solitaire game in a long time and placed 164th. But it sure felt good! Again, thank you for providing this site. Thank you. I love this site and appreciate that you offer many hours of entertainment. Ditto Jabba’s suggestion that we would be happy to pay a subscription, or whatever. Speaking of Jabba, the dude, duddette, rocks. How does the system determine one’s rank at the end of a game (assuming everything is working)? I gather that Score is the most important element, but how do Moves and Time figure in? @hubertparry: Highest score wins. Ties are broken by time and then by moves, or (if you click on the moves column) then ties are broken by lowest number of moves then time. Thank you! I had been wondering whether to emphasize time over other considerations. I’ve come in 2nd a couple of times and really would like to see a 1st. Thanks for the maple leafs for Canada Day! In Freecell, when I win, I don’t get an indication of where I rank. @Dufay: Things are still sketch for (hopefully) just a few more days. During this time you might get a lot of “backend not available” errors. If you click on the small card in the right hand side of the greenfelt menu area it’ll try to send your game again. It should work after a few retries. Again, this is temporary. Once the database is (correctly) moved to it’s final destination it should run a lot better. For several weeks the following has been posted at top of page: Play the Game of the day. We’re currentlly experiencing problems with the server and are working to fix them. Most of the time my placement in a game does not load. THANK YOU ALL who provide such a wonderful service and fun site AT ALL. I wish you any and all blessings possible and think it is wonderful that you do what you do. No sweat, at least I am very happy to wait for whatever – and I am really grateful for the joy I laready had unsing your site! THANKS AGAIN.